Website editor’s note: This website previously reported the an International Appeal to Stop 5G on Earth and From Space had been launched with a request that scientists, doctors and representatives of health and science related organisations sign the petition. The petition is now open to be signed by everyone in the world and should be signed on or before November 25, 2018. If you would like to sign the petition as an individual, the link to click on to sign the petition is below. If you represent an organisation, the link to click on to sign the petition is below. You can read more about the petition in an appeal from the organisers below. If you support the goal of this petition, please share this link with family, friends, colleagues, via Facebook etc and ask them to sign, too. Thank you. The latest alarming study, released on October 15, 2018, shows a much more precipitous decline in insect populations than anyone had suspected—a 30- to 60-fold decrease in insects in Puerto Rican rainforests over the past few decades. On about November 25, 2018, we will enter both the number of signatories and the number of countries they represent into the Appeal that is posted on the website in many languages. 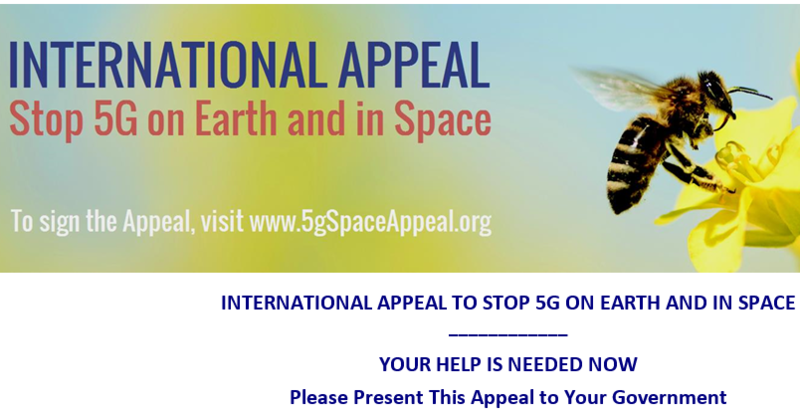 On about November 25, please print out copies of the Appeal from the website (www.5gSpaceAppeal.org/the-appeal) and present it to the appropriate officials in your national government who are in charge of telecommunications and outer space on or about December 1. If you take the initiative to share this link with any of the organsastions or individuals in NZ, please email via this link http://www.5g.org.nz/contact/ with a list of people/organisations whom you have asked to support this appeal and what response you may have received from them. Thank you!